Cordyceps (caterpillar fungus, Cordyceps sinensis) is one of the most valuable mushrooms in Chinese medicine. 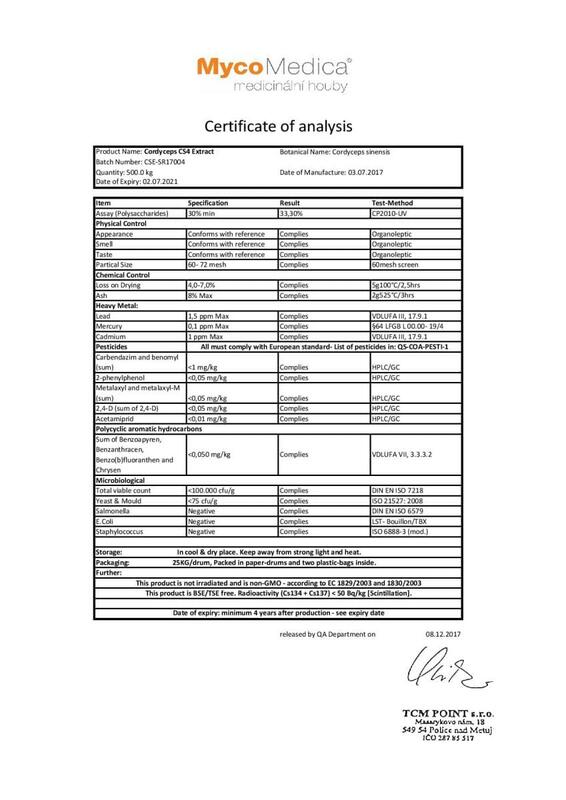 Choose the ideal ratio of polysaccharides, cordycepin, D-mannitol and other bioactive substances for the best results. 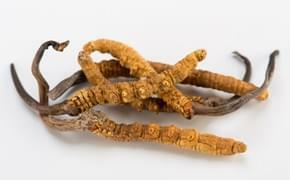 In ancient China and Tibet, Cordyceps (caterpillar fungus, Cordyceps sinensis) has been one of the most valuable mushrooms used for harmonisation of the body and mind. This parasitic fungus is a richsource of beta-glucan, minerals, trace elements and vitamins. Cordyceps sinensis (Dongchonxiacao, yartsa gunbu caterpillar fungus, Ophiocordyceps sinensis) pertains to the genus cordyceps, which also includes Cordyceps militaris, Cordyceps liangshamensis and Cordyceps gunnii etc. (nearly 700 species have been discovered), it’s a sac fungi (Ascomycota), which is edible and parasitic. Its spores will stick to the surface of insect larvae and then fill the entire shell with its sclerotia, from which the ripe mushroom will grow. 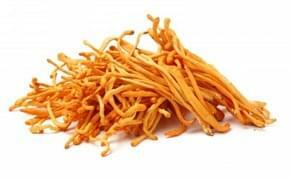 Cordyceps grows in altitudes above 3,500 metres and especially in the Tibetan moutnains and in the Chinese provinces Sichuan, Yunnan etc. The mushroom is gathered in the period between April and August. However, there aren’t many of them left in the wild. Over the past 25 years, its incidence has fallen by 90%, which of course has increased its value in the market, and so the mushroom is also cultivated artificially. The demand for Cordyceps is mainly due to its effects on human health. 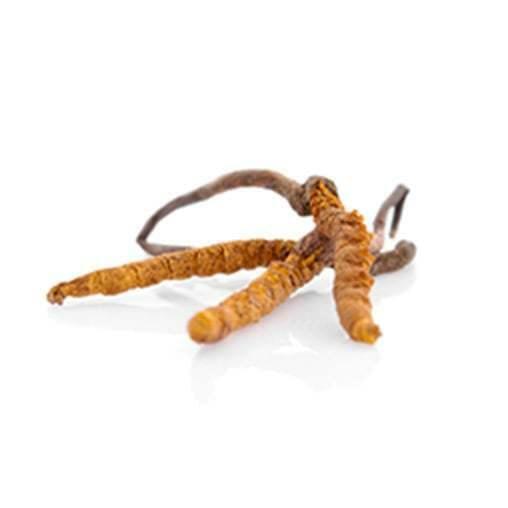 The power of Cordyceps has been used in traditional Chinese and Tibetan medicine for thousands of years. There are stories, which describe how yak herders noticed a change in animals, if they grazed on Cordyceps. Such animals were more vital, stronger, healthier and more potent. Written records about the mushroom can be traced back to 620 AD. The Western world only learned about Cordyceps in 1726, when it was introduced at a mycological conference in Paris. However, at that time, the Western world had no idea about the effects of Cordyceps. 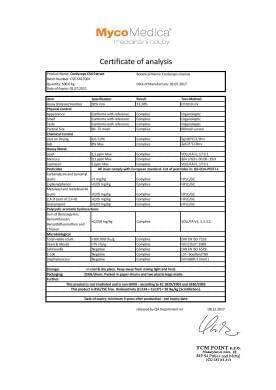 This changed, albeit much later, due to the fact thatnbsp;in 1964, Cordyceps was officially registered among herbal medicines in Chinese pharmacology. You can find more information about effects of Cordyceps at Mushroom Collection or in the section Effects. when using medicinal mushrooms, we recommend increasing your intake of vitamin C, which increases the absorption of active substances. For example, in the form of a Barbados cherry extract Acerola. My chronic bladder inflammation completely disappeared after using Cordyceps CS-4 and Coriolus for 6 months. And I'm not so chilly anymore. I don‘t have cold feet and hands. And this always bothered me. I use Mycomedica mushrooms on Raynaud's syndrome (I still have hands as cold as marble). I‘ve been using Cordyceps and Auricularia for around three months and the problems are much better. Mr. Schirlo always asks how many%? So about 80%. I use Cordyceps CS-4 for my incontinence problem and frequent urination. I take a dose of 2 capsules at noon and 2 capsules in the morning. I’ve been using it for 6 months and I‘ve seen a significant improvement. I take Cordyceps and Reishi to support my psyche, fatigue and irregular menstrual cycle. I’ve been taking this combination for about six months in a dose of 2 Cordycep capsules in the morning and 2 Reishi capsules in the evening. The cycle is almost regular. I'm only really tired after being at work. Even my mood have improved. I'm writing a review on your Cordyceps mainly to get the vitamin C that you promise to everyone who shares their experience... This is a joke  I‘ve been using the Cordyceps diet supplement for some time for what could be called burnout syndrome. My colleagues recommended them and I am extremely satisfied. I have a lot more energy and a desire to do new things. I'm a little afraid of becoming addicted to it. Joke  Thank you very much for the good work you are doing. I recommend Cordyceps for incontinence problems, this problem has plagued me for several years. The status is diminishing. You have beautiful videos about mushrooms, the Fox is really funny. Do you have foxes on offer?  I’ve been using Reishi, Agaricus and Cordyceps for months to strengthen my immune system and for fatigue and hair loss. Everything has improved, and I've tried plenty of other things. 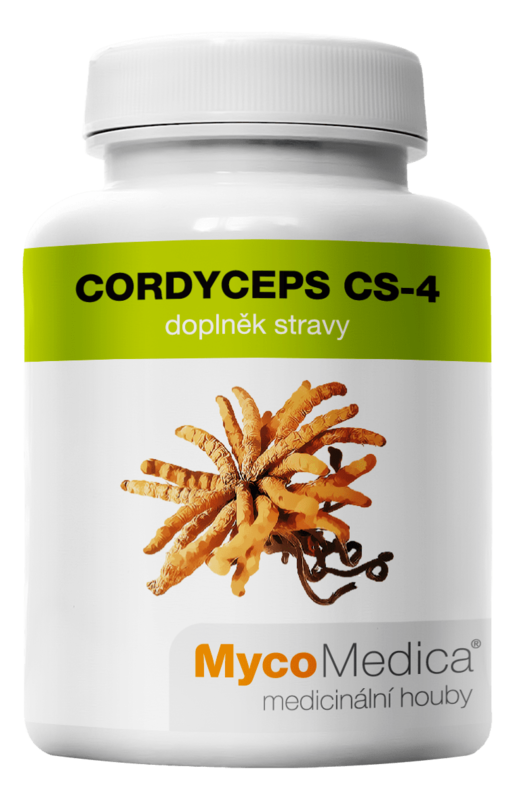 I‘ve been using Cordyceps from MycoMedic for just 2 months, and now I feel its effects. I have a lot more energy. And mainly, my libido has strengthened ... That was the main reason I tried Cordyceps. I was very exhausted after childbirth. According to my Chinese medicine therapist I have drained yang kidney and little blood. He recommended Cordyceps and Reishi from MycoMedica. I felt better after a few days. Today, after using for about three months, I feel almost like in pre-natal, full of strength and energy. Thank you. A friend who also has to deal with prostate problems recommended Cordyceps. After consulting Mr. Schirlo, he advised me to use it together with the Maitake's mushroom. I don‘t go to the toilet so often, I sleep all night, and I also have a lot more energy. I have frequent bladder inflammation. Mr. Schirlo explained to me that I had a weakened kidney (that‘s Chinese kidneys as he wrote) and he recommended that I use Cordyceps. Although we address this problem practically every two months with antibiotics, I‘ve had peace for half a year now. He also advised me to make some changes in my diet. Many thanks. I work as a multi-national company director. After a hectic period at work, I was completely exhausted, and practically unable to get to work or home, I was unable to do anything, I had no desire to do anything new. Exhaustion wasn‘t just on a physical level but also on a psychological level. Exactly how burnout syndrome is described. I tried to use the Cordyceps medicinal mushroom. I experienced the onset of the effects within two weeks. I’ve been using it for almost half a year and I feel very good. I bought Cordyceps MycoMedica for my mother who has long-term problems with her heart and breathing. They feel much better now. So we‘ll continue to use it. I won‘t let go of Cordyceps, I swear by it. I always use it before winter and during winter, because I suffer from inflammation of the sinuses. I started to enjoy it last winter. There was a slight improvement, then I started again last September and this winter and I’ve not once had inflammation of the sinuses. Thanks to you. My son was often sick as a baby. He caught every bacillus or virus around him. He's taking his Cordyceps bark several times a year, and now illness passes him by. I was afraid of long-term incontinence. I also urinated a lot and was very tired. All of these symptoms virtually disappeared after six months using Cordyceps. I took 2 capsules in the morning. I always use for 5 days a week then take a break for 2 days. I had cold legs and was also very chilly. I've been using Cordyceps for 3 months and now it's a lot better. I don’t get frozen feet anymore, and I don’t need the toilet so often. I dedicate myself to top cycling, and Cordyceps along with Coriolus (sometimes I add Reishi) help me to increase performance and shorten the regeneration phase after races. I’ve used the mushrooms for a long time at lower doses and I always increase the dose before races. Cordyceps sinensis je velmi originální houba, která „zahajuje“ svůj život na hostiteli, nejčastěji se jedná o larvy motýlů a nočních můr.